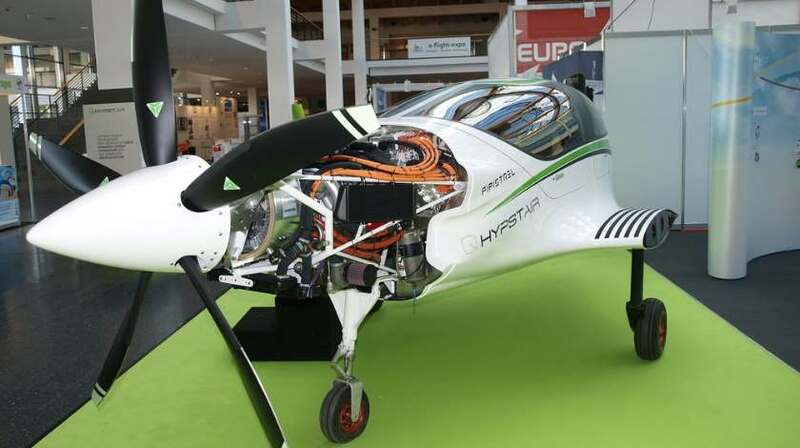 Pipistrel of Slovenia is at AERO Friedrichshafen in Germany showing off the first hybrid airplane in general aviation, the Hybrid Pantera born as a result of its Hypstair project. The sleek four-seater is powered by a Siemens 200 kW electric motor and a Rotax 914 turbocharged gasoline engine that is used to drive the electric generator and keep the batteries charged in flight. The Hypstair electric drive motor is designed to deliver 200 kW of power for takeoff and 150 kW in cruise. The motor can run in electric-only mode, using battery power, generator-only mode or hybrid mode combining the two. A single lever will be used to operate the power plant, and a panel-mounted display will provide status and performance data. For the initial testing, a five-blade, low-rpm propeller has been attached to the motor. The first power-up tested all power modes at low and high power settings. Flight testing later this year will aim to prove that the hybrid combination can deliver similar power output to high-performance GA piston engines.